Winter time and the living is – expensive. Electricity prices have increased at nearly four times the rate of inflation over the last 5 years and will probably continue to do so. One solution to the soaring power bills stemming from heating, lighting and the immoderate use of the oven, is to run away to a warmer place, preferably somewhere in Asia, where the living is cheaper and the climate is tropical. Another is to stay cocooned in a doona all day, watching addictive Icelandic Noir drama series that makes the Australian winter look tropical. Then, like many others, you could traipse around a heated shopping centre all day, drinking coffee and playing with your smart phone. Or you could make a conscious effort to adopt some energy saving routines, at least when it comes to routines in the kitchen. This post is a reminder to myself about energy use. 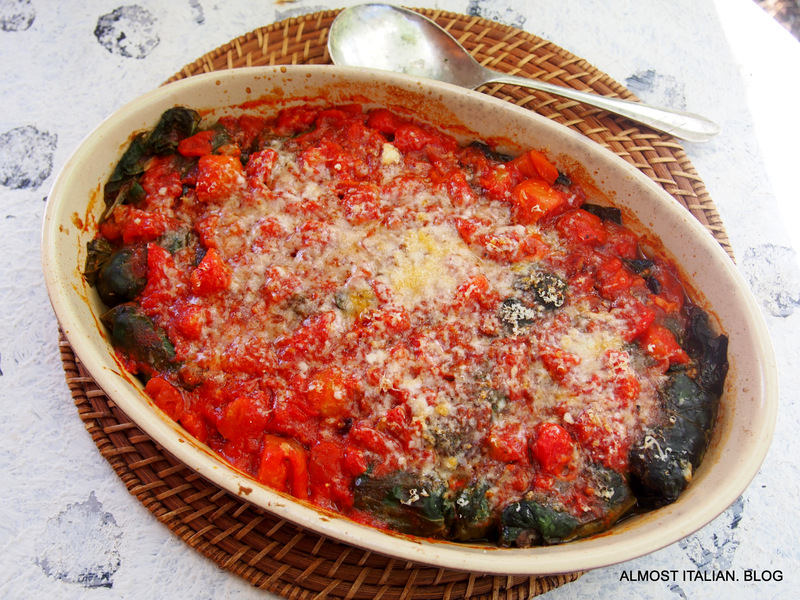 After baking, use the residual heat of the oven to make other basic things for the week. Boiling water is a huge energy waster. Fill up a Chinese thermos with green tea. Always cook too many beans. Finding a stash of pre-cooked cannellini and borlotti beans or chick peas in a zip lock bag in the freezer is like finding a golden nugget. Soup making becomes a breeze. Two of my winter favourite bean based soups can be found here and here. Add barley to root vegetable soups. What is it about Barley Soup that warms us up, both physically and emotionally? If you have just split open a large pumpkin and are baking chunks for a recipe, double the quantity and store the leftovers in a covered bowl in the fridge. 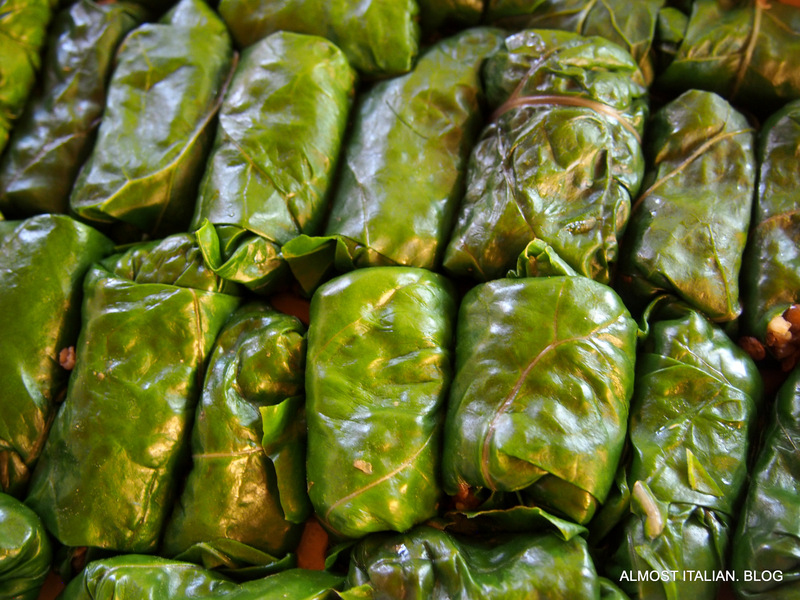 Stuff the pieces, along with fetta and herbs, into filo pastry triangles, add them to a risotto, use them with cooked lentils in a pastie, or toss them through barley to make a winter salad with spinach and nuts. 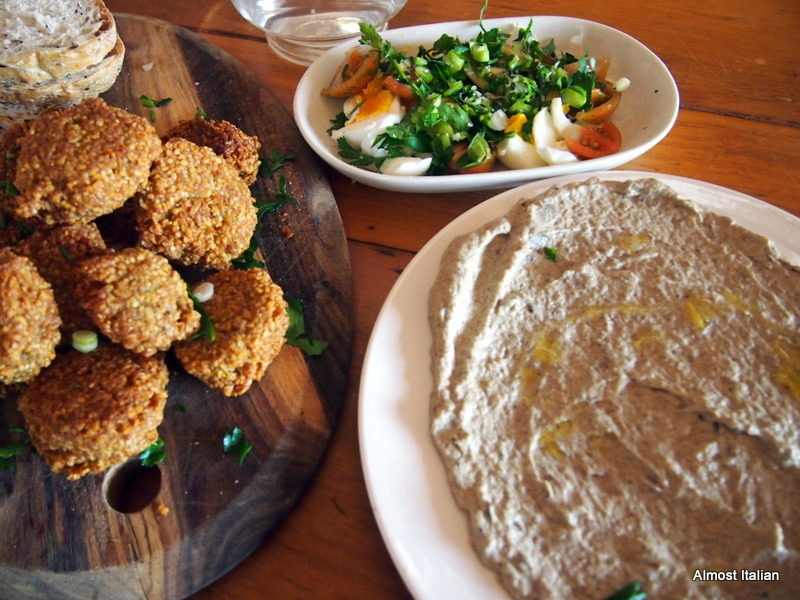 Or head to Ottolenghi land and make this or this. Filo pastry with baked pumpkin, goat’s fetta, herbs, honey drizzle. Always double the pizza dough, whatever quantity you decide to make. Most weeks I make a 500g batch of yeasted pizza dough using this recipe. If the hungry hordes don’t visit, I stretch and shape half the risen dough to make one 35 cm pizza, more than enough for two hungry people, then stash the other half in a zip lock bag in the freezer. Then it’s simply a matter of defrosting the dough, bringing it back to room temperature, and shaping it into a slice baking tin, allowing for another short rise, before dimpling the top with oil, salt and herbs or other leftovers. Left over dough becomes tomorrow’s foccaccia. Preheat oven 200 c FF. Oil a small slab tin ( 26 cm X 17 cm) and stretch the dough to roughly fit. Leave for 30 minutes or more, covered with a tea towel. Push the dough into the corners of the tin and using your fingers, make small indentations in the dough to carry the oil and salt. Brush on a generous amount of olive oil, letting it pool a little in the indentations. 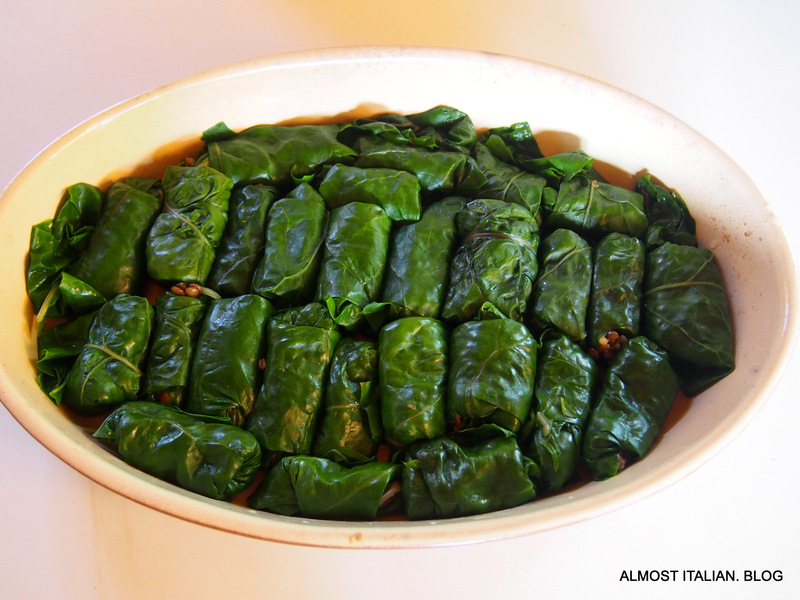 Spread on the finely cut onions, then the pumpkin, then some sage leaves, then plenty of coarsely ground salt. Bake for around 15 minutes, check on the colour of top and bottom, and cook a further 5 minutes if needed. Today was a very good day, but then, every day is special in my favourite Asian city. We’re in Chiang Mai again, and each time I visit, my heart grows fonder. Like an old lover, Chiang Mai unfolds slowly and deserves many visits. It’s no wonder that so many expats call this town home. First stop, the Writers Club for a wine or beer, or just because it’s a bit French and it’s always there. Today we ate at a remarkable Thai vegetarian restaurant, and since we have discovered the word Jeh, along with the little yellow and red flag displaying this symbol, เจ, we then found some more. View from the writers club, Chiang Mai, a town with hidden sophistication. Thai Vegetarian and Vegan food is not at all boring and holy. You won’t miss onions, meat or eggs when you taste these treats. Deep fried shitake mushroom sate with peanut sauce, minced tofu larb studded with dried chilli and basil leaf, a refreshing drink of crushed lemongrass on ice, and so much more. I wanted to order everything from the menu at Pun Pun Slow Food Vegetarian Restaurant. Visit and be delighted by this wonderful temple cafe. Cost, around AU$10 for two. That evening, following a siesta and another temple visit, it was off to Taste From Heaven. Deep-fried mushrooms, coated in a sesame seed batter, made an excellent appetizer to go with a cold beer (Chang, of course). The rain bucketed down outside, and we continued to order. Next a rice noodle dish, a vegetarian version of a Pad See Ew arrived. I love big fresh rice noodles: smoked by the breath of a hot wok, the dish was classic comfort food and went well with the rain. Another dish, a deep-fried tempura morning glory vine, kangkung, with cashew nuts and tofu, was a surprising twist on the meal. All were helped along by a generous portion of red rice. Vegan chocolate brownie? Yes indeed, and a little fork war followed. My glorious day will be followed by more, I know. But today was the day of the Jeh restaurant discovery. I’m in heaven. For my brother Michael, who loves Chiang Mai too. Just as Autumn begins to turn cold and hints at what’s to come, we light our first wood fire and the family menu begins to change. Stock simmers gently on the stove, Anzac biscuits are made, hearty lentil dishes re- appear and eggplants dishes are back on the menu. During the eggplant ( aubergine) season, when they are large, cheap and white fleshed, I am secretly pleased to find a morning fire that is almost spent- save a few red coals and ash. 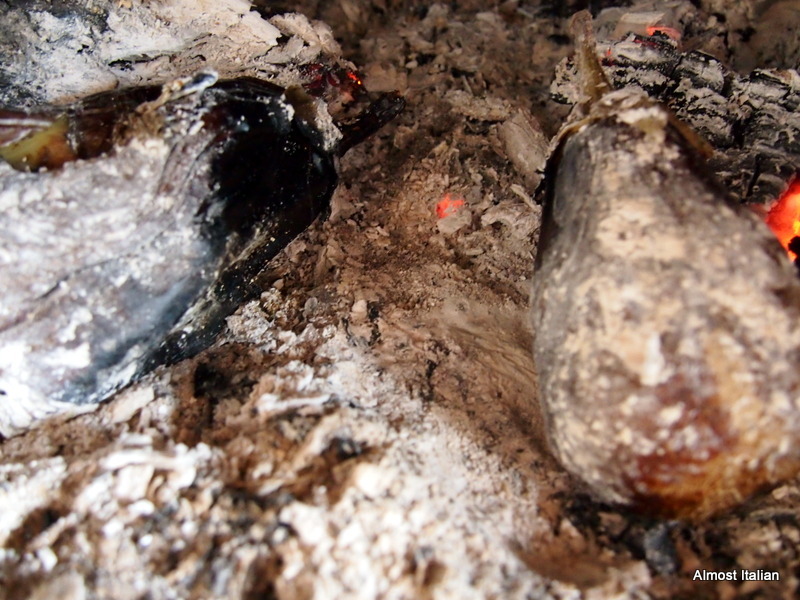 The eggplants are thrown straight onto the coals- and the door to the wood heater is left open.This works equally well in a corner of an open fire. After some time, I return and flip them over. Super smoky Babaghanouj is on the way. After retrieving the charred, blistered eggplants from the fire, slit them open and place in a colander over a bowl to drain. Lunch is some hours away but the flavour base is ready. Today’s Babaghaouj recipe is adapted from Claudia Roden’s ‘Arabesque’. 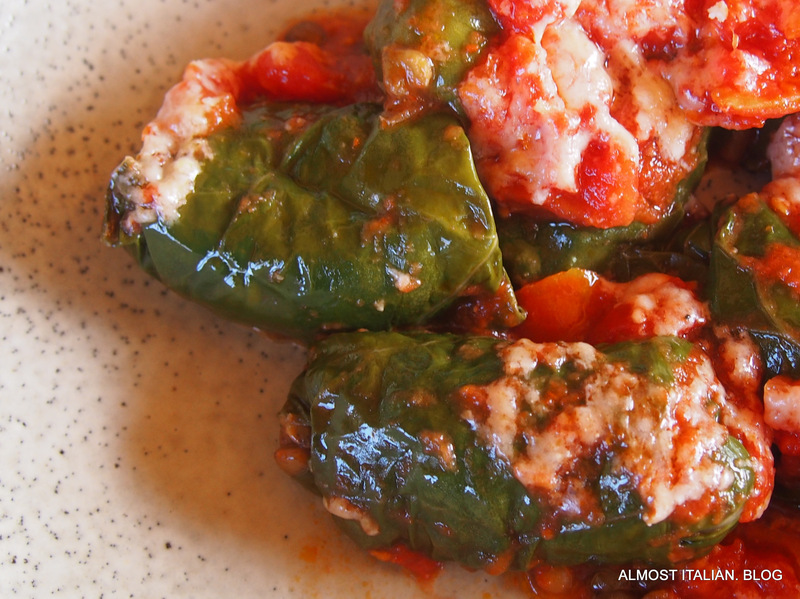 Leah, from the Cookbook Guru, is highlighting Claudia Roden’s recipes this month, in particular, those from the A New Book of Middle Eastern Food. I have been making it this way for so long now: I have experimented with the addition of yoghurt and other flavours but have settled on this smoky dairy free version, with lots of garlic. I recommend that you give Leah’s a go too, especially if you are not into a strong smoky taste and you like the velvety texture that yoghurt brings. 1-2 teaspoons of freshly ground cumin. 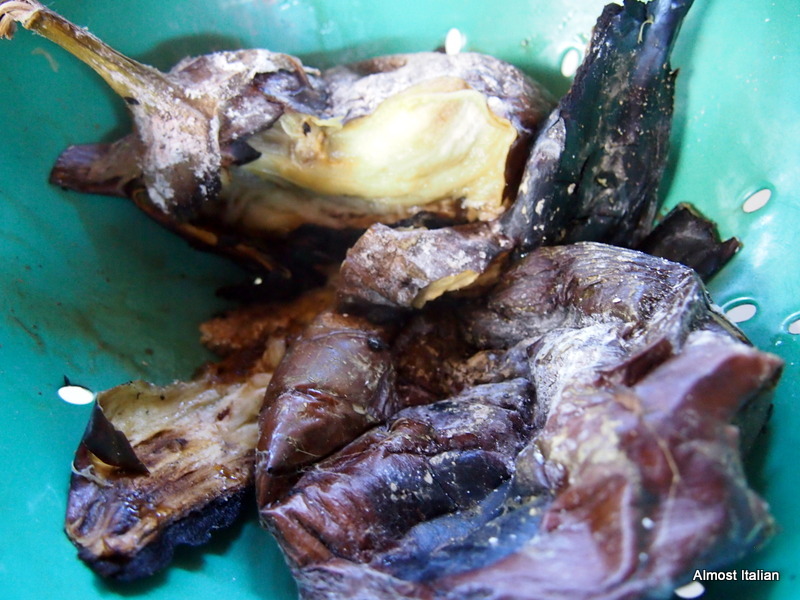 After charring the eggplants in your left over fire, (as above), slit them open, drain them, and peel. Remove all the flesh, place in a food processor with the garlic,briefly process, then add tahini paste, process, then the lemon juice and salt to taste. 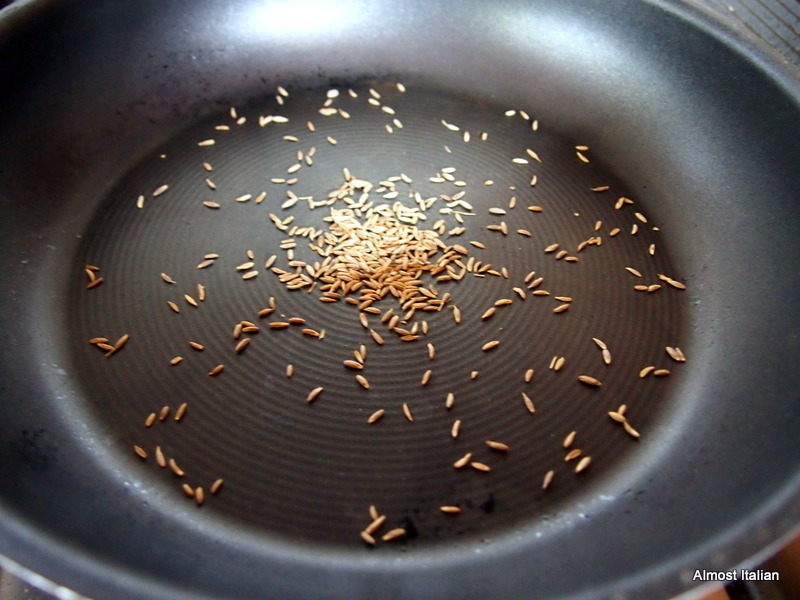 In the meantime, heat a small pan, toast the cumin seeds, then grind them in a mortar. Add to the mixture. Taste. adjust salt or lemon. Swirl out flat on a plate and serve with falafel and other salads. Drizzle with a little EV Olive Oil and sprinkle with chopped parsley. The Arabic term , Baba Ghanoush, means “pampered papa” or “coy daddy”, perhaps with reference to its supposed invention by a member of a royal harem. 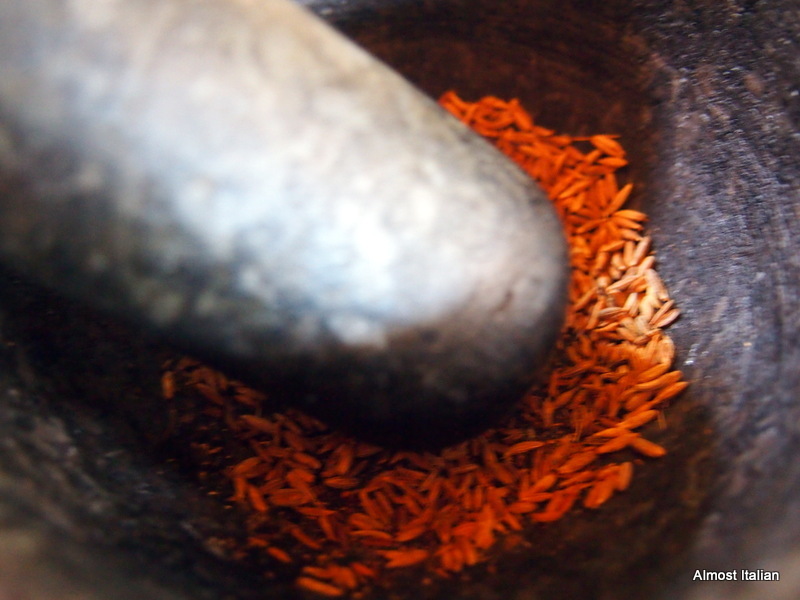 It really is worthwhile grinding fresh spices, if you use them. For me, it’s a chance to break out my baby mortar and pestle.